Today is Ladies Bible Study Day at my Church. My boys are looking forward to seeing Ms. Melba and their buddies in the nursery, and I'm curious what Kayanne, our leader, will have to share with us. We always have a great discussion over an important passage, but what I really like is the time I get to spend with friends. If you don't know me, I have a busy house full of boys. While my two oldest are off at school, my two youngest and I hang out together at home. It's wonderful. But Wednesdays are like a breath of fresh air. We have a pretty diverse group, ranging from new moms to Great Grandmothers, working girls to homemakers. Some have grown up in our church, and others have moved in recently. But we've grown to be quite close, simply because we make a point to spend Wednesdays together- laughing and talking, sharing and praying, learning and working, together. The picture above shows a string beads that Sandra, one of our members, made for each of us this Christmas. 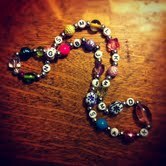 It includes an initial for every member of the group as a reminder to pray for each other through the week. I'm the G! I think it paints a pretty good picture of what Wednesday mornings mean to all of us...a beautiful group of friends devoted to each other. Do you have a group of friends like this in your life? We're all made to need a place to connect, be needed and be loved. I encourage you to find some friends you can commit to get close to. Your life will be so much richer! P.S. There are so many places to meet with other ladies and connect! If you don't have a place, seek one out. Almost any community will have Business Women's groups, Student Unions, MOPs groups and quilting clubs. Of course, if you're local, come join us at Pleasant View Baptist Church on Wednesdays. There's plenty of room for you in our group!